Under a deposit return system the drinks you want to buy will stay at the same price. It’s only at the checkout that you pay a small deposit, which is refunded to you as soon as you return the container. You don’t have to take it back to where you bought it – any local shop, supermarket or service station will be able to give you your deposit. There will be a really big network of places across Scotland where you can return your containers. At small stores, bottles and cans are returned to the person behind the counter. In other stores, there will be ‘Reverse Vending Machines’ that you feed your bottles into which know what size the bottles are, what material they’re made from and how much you’re owed for returning them. It’s really that simple. And the shopkeepers don’t lose out, as they receive an agreed fee, as part of the system, for the time it takes them to return deposits, as well as being compensated for the space the machines take up. If you do your grocery shopping online, the same van that brings your delivery can take away your empties and the deposit can be refunded to your account. 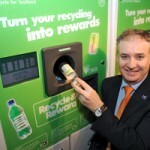 Cabinet Secretary Richard Lochhead visited Sweden in 2013, in part to look at the Swedish deposit return scheme. More info on the Cabinet Secretary’s visit is available on the Scottish Government website. Read the May 2015 feasibility study, published by Zero Waste Scotland. Research commissioned by Zero Waste Scotland in May 2015 was unable to find any reason a deposit return system wouldn’t be feasible in Scotland. 78% of Scots supported the proposals in a recent poll, with just 8.5% against. APRS commissioned polling from Survation in May 2015, which showed a deposit return system would be very widely welcomed.